The BlackBerry Bold 9780 didn't manage to impress us during our traditional audio quality test. The handset does decently when used with an active external equalizer, but still falls notably short of the best we have seen. And things get even worse when a pair of headphones is plugged it. With no resistance applied (i.e. the active external amplifier case) the Bold 9780 has decent signal-to-noise ratio, dynamic range and stereo crosstalk. The distortion levels are also kept well under control. However the frequency reponse is far from optimal with the extreme bass frequencies completely cut-off. When headphones are connected, the Bold 9780 stereo crosstalk increases quite significantly, while the intermodulation distortion rises (though that still remains nothing to worry about). 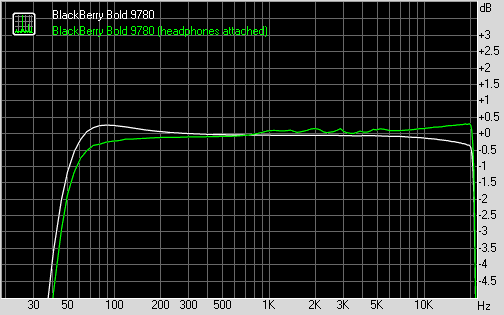 Frequency response worsens even further so you can see why we are not able to give the Bold 9780 full points in this test. The landscape screen is a good start, while the video player itself isn’t bad either. Its styling might not be too impressive, but the functionality is mostly there. Browsing your videos works much like browsing your tracks in the music player. There’s again searching by typing a part of the desired file’s name so navigation is in most cases quick enough. The video player normally works fullscreen with the virtual buttons only appearing upon a key press. There available controls include play/pause, stop and forwarding buttons. Pressing the menu button reveals the other available features – picking the video size (fullscreen, fit to screen and original size), setting a video thumbnail or connecting a Bluetooth handsfree. Volume is controlled through the dedicated buttons on the side of the device. There is support for customizable closed captions too, but the best part about the Bold 9780 video player is probably its DivX and XviD support. It didn’t manage to play all videos we threw at it, but most of them worked. There were also a few videos where we got the sound, but couldn’t get the video stream to run. The general performance here is decent, which is probably more than most BlackBerry-purchasing users will ever need. A couple of cosmetic changes and a few new minor features is what sets the Bold 9780 gallery apart from the BlackBerry OS 5 version. Images can be browsed in grid mode or viewed as a standard list. There’s searching by name here too, but we’re not the type that remembers the names of our cameta snaps, so we won’t count that as an extra. Photos can only be browsed in landscape mode or you can manually rotate them. Unfortunately the Bold 9780 has no built-in accelerometer to provide automatic rotation. You can skip to the next photo without returning to the gallery – you just flick your finger over the trackpad and you are done. Checking an image’s properties, going into zoom mode as well as starting a slide show, are all a menu key click away. Setting one of your images as a homescreen wallpaper is available too. Picture browsing is pretty fast and so are zooming and panning. We would have preferred if the volume rocker could also be used for zooming, but the gallery is generally pretty good.